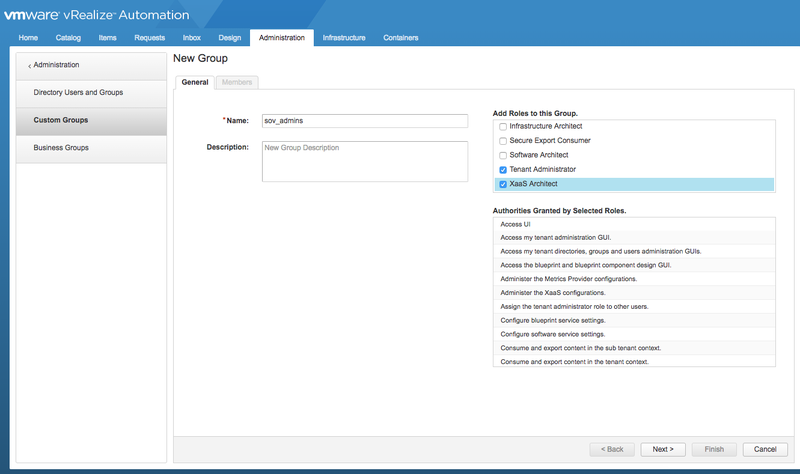 Requires a vRA group for ownership of the SovLabs Endpoints, Profiles and Services as well as connectivity into vRO to run workflows. vRA Console Create a vRA Custom Group with the name sov_admins and make the sov_admin Service Account user a member of this group. This Custom Group name is suggested for the sake of simplicity. *If using AD users and groups, it is assumed a Directory is set up in vRA which allows vRA to authenticate via Active Directory.